Rapture Practice is Aaron Hartzler’s stunning memoir of growing up in an evangelical household. Everything is great until Aaron starts to question both his faith and his sexuality. He tries to confront these issues while still pleasing his parents, but finds this to be an increasingly difficult task. Honestly, how sinful can going to the movies and listening to music really be? Aaron takes a bold look at faith, sexuality, and being true to yourself while still keeping it light and relatable. This book is an incredible read that I hope everyone picks up! Sometimes salvation is found in the strangest places: a true story. Aaron Hartzler grew up in a home where he was taught that at any moment the Rapture could happen. That Jesus might come down in the twinkling of an eye and scoop Aaron and his family up to heaven. As a kid, Aaron was thrilled by the idea that every moment of every day might be his last one on planet Earth. But as Aaron turns sixteen, he finds himself more attached to his earthly life and curious about all the things his family forsakes for the Lord. He begins to realize he doesn't want the Rapture to happen just yet--not before he sees his first movie, stars in the school play, or has his first kiss. Eventually Aaron makes the plunge from conflicted do-gooder to full-fledged teen rebel. Whether he's sneaking out, making out, or playing hymns with a hangover, Aaron learns a few lessons that can't be found in the Bible. He discovers that the best friends aren't always the ones your mom and dad approve of, and the tricky part about believing is that no one can do it for you. In this funny and heartfelt coming-of-age memoir, debut author Aaron Hartzler recalls his teenage journey to find the person he is without losing the family that loves him. It's a story about losing your faith and finding your place and your own truth--which is always stranger than fiction. Aaron Hartzler has written books, screenplays, and a great number of tweets. 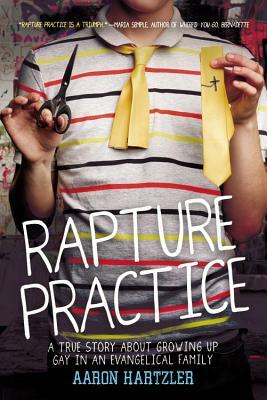 His first book, Rapture Practice (2013) is a true story about his own life, a memoir about getting kicked out of his Christian high school in Kansas City two weeks before graduation. The New York Times called Rapture Practice "effervescent and moving, evocative and tender." It was also one of Amazon's Best Books of 2013, and a finalist for the Lambda Literary Award. He invites you to visit him online at www.aaronhartzler.com. "...Effervescent and moving, evocative and tender..."
* His story emphasizes discovery more than rebellion, and the narrative is carefully constructed to show and not judge the beliefs of his family and their community... Hartzler's laugh-out-loud stylings range from the subtle to the ridiculous...A hilarious first-of-its-kind story that will surely inspire more." "What rings very true... is the author's thoughtful search for answers to his heart's biggest questions, and his pragmatism and sense of humor on the journey." "This heartfelt memoir [and] compelling story...will speak volumes to adolescents." "Rapture Practice opened my eyes--and my mind--to a segment of society I've never quite understood. Wherever you weigh in on the religion scale, this book will speak to you." "I think the best stories are the ones about the absurdity and beauty of growing up--and Aaron Hartzler's Rapture Practice is one whose humor, honesty, and heart make universal even the most unique situations. This is a story about faith that gives you just that--faith in humanity, in family, and in yourself."